Harborough district teenagers helping out in the garden of The Cube youth centre in Market Harborough in the summer as part of a National Citizen Service social action community project. 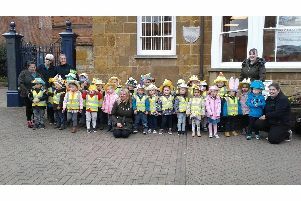 Youngsters sometimes get a bad press but young people from the Harborough district have been praised for helping out with community projects in the area. About 35 young people aged 16 and 17 from the Harborough district, were among the 1,000 participants countywide over the last two years working on projects through the National Citizen Service. The service is a national voluntary programme designed to give teenagers the opportunity to develop life skills while taking part in new and exciting challenges and making new friends. Places are available now for its next training course, starting next month. The service’s volunteers helped spruce up the gardens at The Cube youth centre in Market Harborough, off St Mary’s Road at Symington’s Recreation Ground, in the summer. This relatively new youth club was in need of a team to help re-design their garden. The service’s volunteers spent time designing a tyre wall that would be painted and secured to border the patio area of the garden. The team worked hard to clear the surrounding area and worked with other members of staff from The Cube. The volunteers then chose to help out with the Rock on the Rec music festival by making pizzas and refreshments. Jenny Lyon, from The Cube, said: “We at the Cube loved having the NCS team with us this summer. “They worked really hard, had a good laugh and did a fantastic revamp of our garden. Fleckney Parish Council was also in need of volunteers to help rejuvenate its youth club building, based at Fleckney Recreation Ground in Leicester Road. The service’s team repainted and carried out some basic DIY work and created an activity area and chill out area for other young people. Alex Brown, the facilities manager from the parish council, said: “I had the pleasure of hosting an NCS team who chose our social action project to modernise and improve the youth club building in Fleckney. “The group worked very hard and I was reminded of The Apprentice by how they split up jobs and responsibilities to achieve their goals. “The building is looking a lot more welcoming and relaxing, and a lot cleaner now. The service’s next week-long training programme starts on February 13 at PGL Caythorpe in Grantham, Lincs, and in Leicester. Costing £35 to join, it includes a three-night stay bonding with other youngsters, three days working with a local businesses to help improve skills for CVs and a social action project that will gives them a chance to give back to their community. Food and three nights accommodation are included in the price.